I shot this photo Monday afternoon in Lucy Park. While driving through the park looking for inspiration for a different type of weather photo for the newspaper, I spotted the doe walking through the middle of the park and as I drove around to get a better view, I lost sight of her for a minute. Moments later, I see her with her little fawn following close behind. It was raining steadily, but I parked, grabbed my camera and put the Nikon 1.4x teleconverter and 70-200mm f2.8 on to give me as much reach as possible. The deer trotted on their way to the northwest edge of the park and I eased along behind them about 75 yards back. 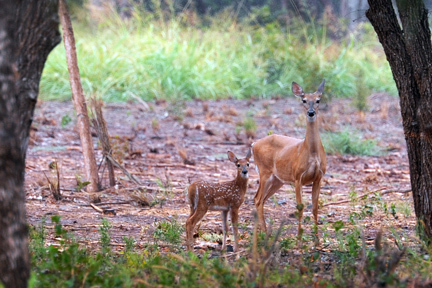 The momma deer noticed me, stopped and stood statue-still for a few seconds while I shot 5 or 6 frames of her and her baby. Then, they turned and took off with their bright white tails bobbing . It was a neat experience.